The big schooners race past the Royal Yacht Squadron at Cowes circa 1911. To leeward is the largest schooner seen to date in Cowes, the German Kaiser’s Meteor IV at 400 tons. She was designed by Max Oetz and launched in 1909. 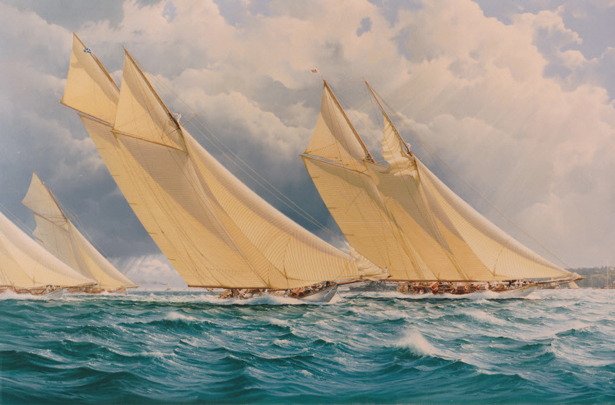 To windward is Westward, designed by Nathanial Herreshoff and launched in 1910. At 135’ LOA, she was able to carry a maximum sail area of 13,483 square feet. Both yachts are shown hoisting more sail.